A nucleoside, schematically speaking, is two-thirds of a nucleotide. Nucleotides are the monomeric units that make up the nucleic acids deoxyribonucleic acid (DNA) and ribonucleic acid (RNA). These nucleic acids consist of strings, or polymers, of nucleotides. DNA contains the so-called genetic code that tells our cells how to function and how to come together to form a human body, whereas the different types of RNA help translate that genetic code into protein synthesis. Nucleotides and nucleosides are both monomeric units of nucleic acid. They are often confused with one another, because the difference is slight: nucleotides are defined by their bond with a phosphate -- whereas nucleosides lack a phosphate bond entirely. This structural difference changes the way the units bond with other molecules, as well as the way they help make up DNA and RNA structures. A nucleoside by definition has two distinct parts: a cyclic, nitrogen-rich amine called a nitrogenous base, and a five-carbon sugar molecule. The sugar molecule is either ribose or deoxyribose. When a phosphate group becomes hydrogen-bonded to a nucleoside, this accounts for the entire difference between nucleotide and nucleoside; the resulting structure is called a nucleotide. To keep track of nucleotide vs. nucleoside, remember that adding a phosphate group changes the "s" to a "t." The structure of nucleotide and nucleoside units are distinguished primarily by the presence (or lack thereof) of this phosphate group. Each nucleoside in DNA and RNA contains one of four possible nitrogenous bases. In DNA, these are adenine, guanine, cytosine and thymine. In RNA, the first three are present, but uracil is substituted for the thymine found in DNA. Adenine and guanine belong to a class of compounds called purines, while cytosine, thymine and uracil are termed pyrimidines. The core of a purine is a double-ring construct, one ring having five atoms and one possessing six, whereas the smaller-molecular-weight pyrimidines have a single-ring structure. In each nucleoside, a nitrogenous base is linked to a ribose sugar molecule. Deoxyribose in DNA differs from the ribose found in RNA in that it has only a hydrogen atom in the same position that ribose has a hydroxyl (-OH) group. 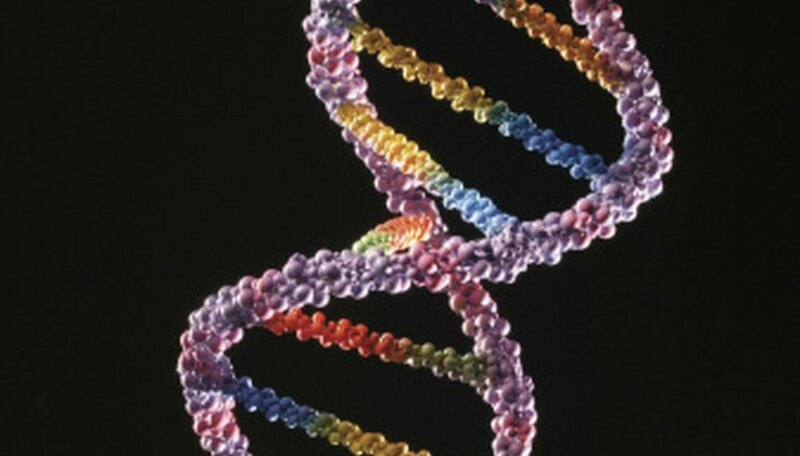 DNA is double-stranded, while RNA is single-stranded. The two strands in DNA are bound together at each nucleotide by their respective bases. In DNA, adenine in one strand binds, to and only to, thymine in the other strand. Similarly, cytosine binds to and only to thymine. Thus you can see not only that purines bind only to pyrimidines, but also that each purine binds only to a specific pyrimidine. When a loop of RNA folds in on itself, creating a quasi-double-stranded segment, adenine binds to and only to uracil. Cytosine and cytidine -- a nucleotide formed when cytosine binds with a ribose ring -- are both components found within RNA. When a nucleoside gains a single phosphate group, it becomes a nucleotide – specifically, a nucleotide monophosphate. The nucleotides in DNA and RNA are such nucleotides. Standing alone, however, nucleotides can accommodate up to three phosphate groups, one of which is bound to the sugar portion and the other(s) linked to the far end of the first or second phosphate. The resulting molecules are called nucleotide diphosphates and nucleotide triphosphates. Nucleotides are named for their specific bases, with "-os-" added in the middle (except when uracil is the base). For example, a nucleotide diphosphate containing adenine is adenosine diphosphate, or ADP. If ADP collects another phosphate group, it comes adenosine triphosphate, or ATP, which is essential in energy transfer and utilization in all living things. In addition, uracil diphosphate (UDP) transfers monomeric sugar units to growing glycogen chains, and cyclic adenosine monophosphate (cAMP) is a "second messenger" that relays signals from cell-surface receptors to the protein machinery within the cell's cytoplasm. Beck, Kevin. "What Is the Difference Between a Nucleotide & a Nucleoside?" Sciencing, https://sciencing.com/difference-between-nucleotide-nucleoside-8591642.html. 23 October 2018.